Working with file manager has been a part of the habit of computer users. All modern operating systems already features a default file manager to help users to manage files. In Windows, you have File Explorer (formerly known as Windows Explorer). However, the default file manager offered by operating systems often comes lack of features. The major downside of File Explorer is that it doesn’t support tabbed browsing. Windows users have to go back and forth from one folder to another to copy a lot of files, which certainly involve lots of mouse clicks as well. The problem even gets more complicated if the source and destination lie deep in sub folders. If you only copy the files once, then there is no problem with that. What if you have to copy lots of files from different sources? Wouldn’t it be much easier if you could switch between tabs in file manager? XYplorer is a great file manager to handle such task since it allows you to open multiple tabs in a single window. XYplorer is a file manager for Windows. You can use it to replace File Explorer in case you need more advanced features to manage your files. Tabbed browsing is just one example of the XYplorer features. It has plenty other features that File Explorer doesn’t have one. XYplorer is compatible with all Windows versions, including the ancient Windows XP. It also runs seamlessly on Windows Server. The developer of this tool has just released the latest version of XYplorer (version 19.60) in last January 30. XYplorer itself has been around for almost 2 decades as it was initially released in 1999. Once installed, XYplorer will be well-integrated with the Windows system. It also supports contextual menu just like File Explorer, allowing you to access menus and perform certain operations easier way. Common shortcuts like Ctrl+C, Ctrl+V, Ctrl+F also apply on XYplorer. XYplorer is a feature-rich file manager for Windows that is great for an advanced file management. One of the standout features of XYplorer is navigation. XYplorer is a dual-pane file manager, but you don’t have to always working in a dual-pane mode. On each pane, you can open multiple tabs for even easier navigation. The dual-pane mode can be set either horizontal or vertical according to which mode you are more comfortable to work in. The interface of XYplorer is customisable. You can, for instance, hide the toolbar to make it look simpler. If you love something dark, XYplorer also offers a dark mode. If you have a touch screen device that is powered by Windows 10, you can also enable the Touchscreen Mode which is also available on XYplorer. There are plenty of features offered by XYplorer, following are some of the notable ones. As mentioned above, one of the standout features offered by XYplorer is navigation. You ease you to navigate between folders, XYplorer offers dual-pane mode. Enabling this feature will split the XYplorer window into two parts. The dual-pane itself can be either horizontal or vertical. This feature is pretty handy if you have to move or copy tons of files from different sources. Plus, XYplorer also supports tabbed browsing. You can open multiple tabs on each pane. 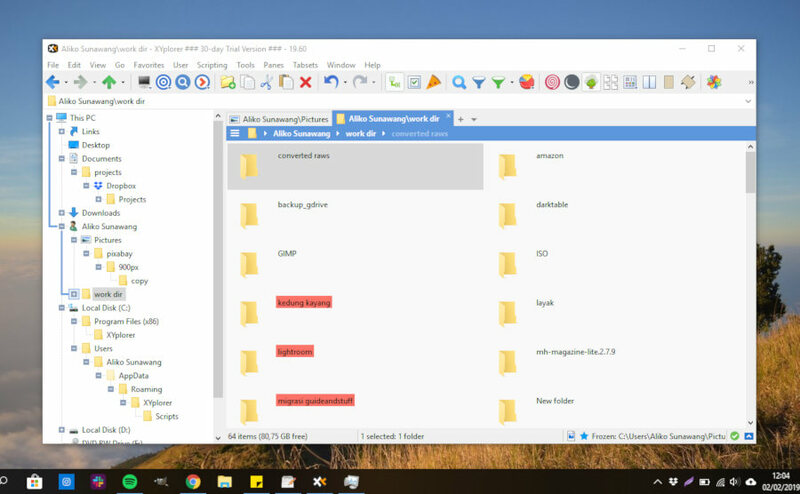 The navigation feature of XYplorer is pretty handy if you want to backup files from your computer to external storage. In addition to dual-pane and tabbed browsing, XYplorer also features breadcrumb to allow you return to previous folders more easily. Did you ever in a situation where you wanted you want to rename multiple files at once? For instance, you are a photographer who just made a photo session with your model. After transferring your photos to computer you suddenly wanted to rename the photos to ease your job in managing them. 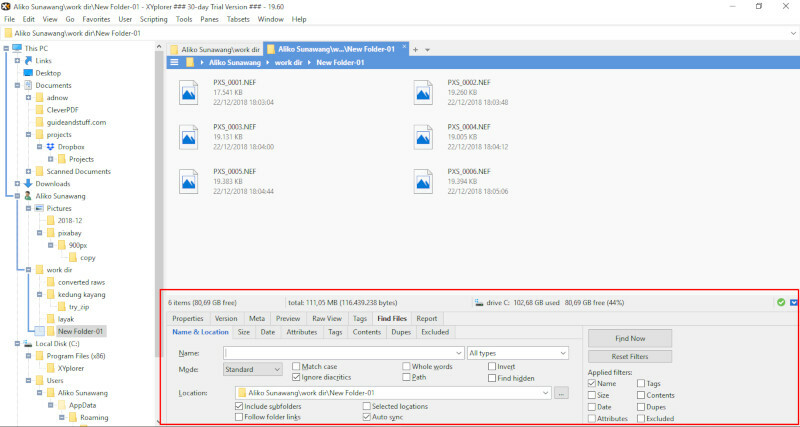 With XYplorer, you don’t have to rename those photos one by one which can take time. XYplorer allows you to rename multiple files at once. XYplorer will rename your files incrementally. Or, you can also set the file names yourself. To perform a bulk rename, select the files you want to rename and right-click to display the contextual menu. Then select Rename Special. You can preview the new file names before applying the changes. When managing files, you sometimes get curious about the content contained on certain files. XYplorer also has a feature to allow you preview a file so you can quickly get to know the file content. The preview is displayed in a panel. 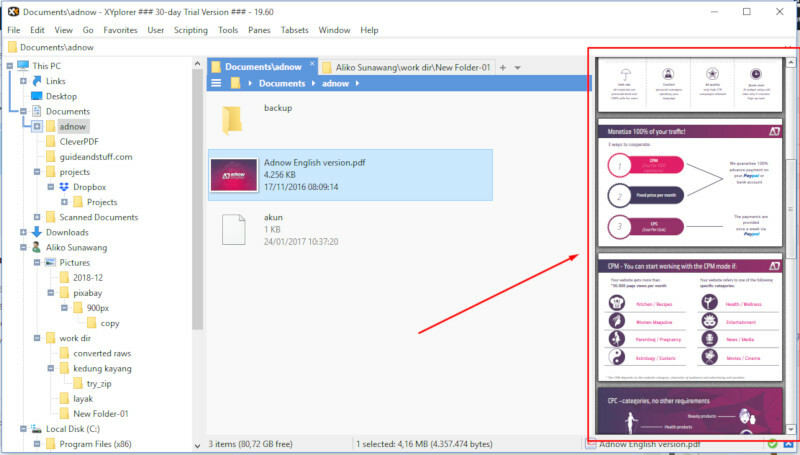 Interestingly, the file type that can be previewed is not limited to image, but also videos, texts, documents and even audios. You can enable the preview feature by activating the Show Preview Pane option under the Window menu. Speaking of preview, XYplorer also features Hover Box which allows you to peek at the content of the file by just hovering your mouse over a file. A tiny preview pop-up will appear each time you hover your mouse over a file. Again, this feature is not only works on images or texts, but also folders and even archives. Hover Box itself is disabled by default. To enable this feature, you can go the Configuration page (F9) and tick the Show Hover Box option on the File Info Tips subsection under the Information section (visit this page to learn more). XYplorer features an advanced search to allow you find files that you occasionally use. You can set several parameters like size, date, name, attribute and so on. You can simply press the Ctrl+F keys to enable this feature or click the tiny arrow icon on the bottom-right corner of the XYplorer window. A search panel will appear. Another feature offered by XYplorer is Scripting. This is an advanced feature and requires scripting knowledge to use. You can use this feature to add recurring tasks for file management efficiency. To learn more about scripting in XYplorer, you can refer to this page. XYplorer can run seamlessly on all version of Windows. It is technically a 32-bit app, but can run on both 32-bit and 64-bit Window machines. This app doesn’t consume much memory. On Windows 10 (64-bit), this app consumes only about 14MB of RAM. The memory usage might will increase depending on the use, but mostly, the memory consumption of XYplorer is still below File Explorer. XYplorer is a great alternative if you are looking for a file manager for Windows that has more advanced features than File Explorer. This file manager comes with lots of features that File Explorer doesn’t have one. Including dual-pane mode and tabbed browsing that are pretty handy if you have to backup your files to external storage. XYplorer is well-integrated with the Windows system. It supports contextual menu which allows you to access some menus and operations by right-clicking. XYplorer itself is a paid tool, but the developer gives you a chance to try it for free for 30 days. The trial version of XYplorer is fully functional. You can try all of the features without exception.